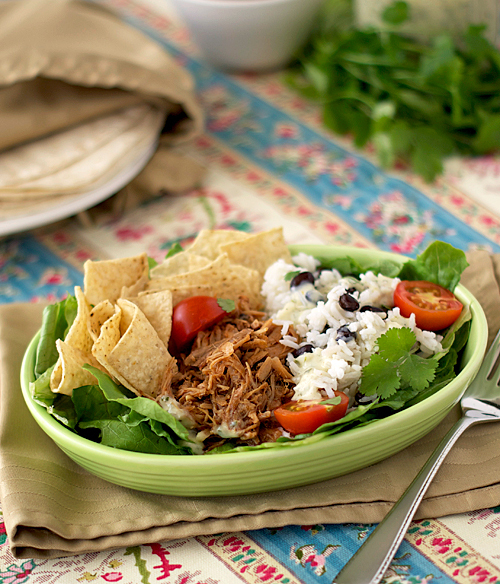 The biggest recipe fail of my marriage was trying to make a sweet barbacoa pork like this one. I had gone to a baby shower soon after my husband and I were married and fell in love with the sweet pulled pork they served. I asked my friend if she could track down the recipe and she e-mailed me with it a few days later. Looking back now, there were several things about the recipe that should have raised red flags. Like the fact that the pork was slow cooked in 3 CUPS of worchestershire sauce. Folks, no recipe should call for that much worchestershire sauce. Unless it serves about 40,000 people. Undeterred by what my common sense told me was a spectacular mistake, I followed the recipe and forged bravely onward. I had already tasted the recipe at the shower so I assumed it must be right. It wasn't. Beside the smell of that much cooking worchestershire sauce pervading the house for 6 hours, the taste was just as horrible as you might expect. It was like eating straight worchestershire sauce, which I really don't recommend if you can avoid it. To this day, I'm not sure if I was the victim of a typo, an honest mistake, or a trick to keep a family recipe within the family. Regardless, I forgot about sweet barbacoa pork until a month ago when I decided to give it another try. This time, I had success. So much success, actually, that I've made it three times in the past month. Since each batch makes about a week's worth of leftovers, that means I've eaten this at least once a day for roughly three weeks. Part of that is sheer laziness since it is so easy to put together, but the other part is that really is good. Very good. It's moist and tender with a sweet taste and a slightly spicy kick. I was skeptical about the use of Coca Cola in this recipe but it lends great flavor and enhances the sweetness of the pork. One of the best parts about the finished pulled pork is that it is so versatile. You can add it to a quesadilla or a burrito, serve it over rice, or serve it as part of a giant salad with rice, beans and chips. Not surprisingly, the salad is my favorite way to eat it. No matter how you serve it, though, it's one of those great crockpot recipes that you keep on hand for when time is short or when you want to easily feed a crowd. Or have leftovers for a week. And I promise you, there isn't a single drop of worchestershire sauce in it. Put the pork, 1 can of Coke and 1/4 c. brown sugar in a Ziploc bag to marinade. Marinade in the refrigerator for a few hours or overnight. Pour meat and marinade into crock pot. Add the water and cook for 4-5 hours on high or 7-8 hours on low, or until meat is starting to get tender and will shred easily. Drain liquid. Shred meat with two forks into bite sized pieces. Put shredded pork back in crock pot with 1 1/2 cans of Coke, 3/4-1 cup brown sugar (depending on how sweet you like your pork), garlic, adobo sauce from the chipotle peppers, taco sauce, ground mustard and cumin. Cover and and cook on low for 2 hours or high for 30 minutes. 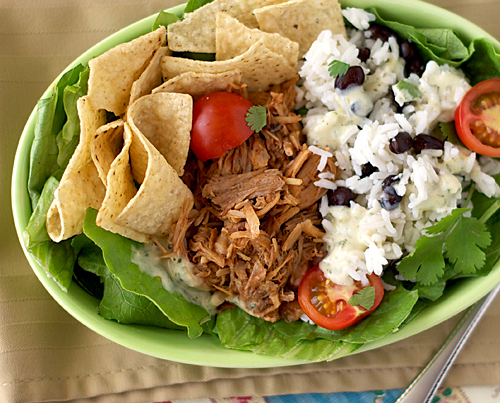 Stir up the shredded pork and serve over rice, in a burrito or on a salad. Sounds delicious! Would also make for excellent nachos and quesadillas, so versatile! Coca cola, my favorite beverage, in pulled pork, one of my favorite meals? Count. Me. In. 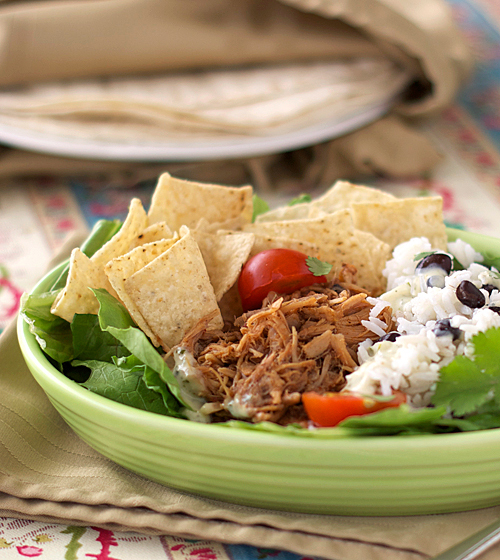 I love pulled pork, it really is one of the easiest, most delicious things you can make. Yours looks fantastic! This looks so unbelievably mouthwatering, Nicole! What a killer recipe. This will definitely be on my to-try list for soon. Thanks for sharing! Mmmm I will be trying this one very very soon! What cut of pork roast did you use? Shoulder or something? How spicy is the meat? She Who Must Be Obeyed™ thinks milk is too spicy, so I have to be careful. That looks so fantastic! I know my husband would love it. Great pictures. I've used both what my grocery calls a "pork loin roast" and pork shoulder in this recipe. The pork shoulder shredded very well, but I didn't prefer how greasy it was after cooking. In my mind, the lower fat "pork loin roast" worked much better, but it could be just a person preference. The only thing I wouldn't suggest would be using a pork tenderloin since that is so lean it wouldn't shred well. I'm fairly wimpy when it comes to spice and I didn't think it was too hot. That said, if milk is too spicy I would suggest only using half the adobo sauce, or adding just a teaspoon at a time at the end of cooking to make sure it isn't overly spicy. No, I haven't tried the pork tinga recipe, but I'll have to give it a try. I have the ATK slow cooker book but have only tried a few recipes in it so far. Thanks for the suggestion! and the bean and rice is just the cilantro lime rice from this recipe: http://heatovento350.blogspot.com/2011/06/mexican-grilled-chicken-bowl-with.html with black beans thrown in.